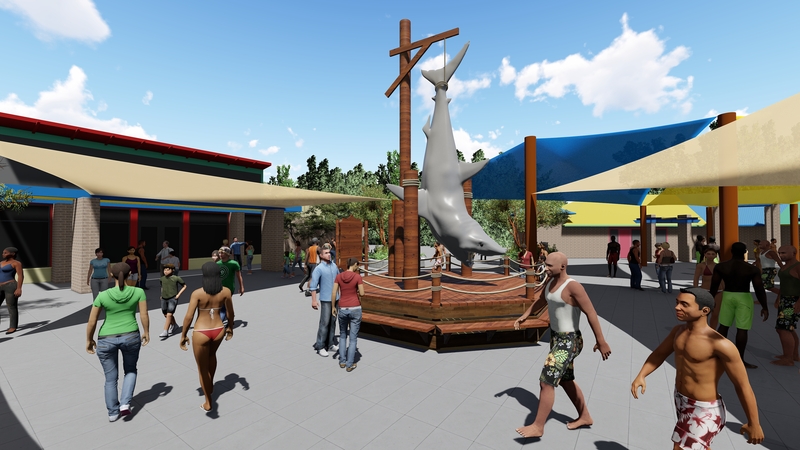 Wet ‘n’ Wild Phoenix will be rebranded Six Flags Hurricane Harbor Phoenix, when it opens March 16 for the 2019 season. Featuring over 30 thrilling slides and attractions, Arizona’s biggest and most diverse waterpark is completing renovations and will debut a new look, updated dining area, expanded seating, extensive Caribbean theming, and other upgrades throughout the expansive 35-acre property this spring. Six Flags Hurricane Harbor Phoenix features more than 30 award-winning slides, rides and attractions—many voted top 10 in the nation. The park boasts North America’s first gravity-defying dueling water coaster that blasts riders uphill across 830 feet of hair-raising drops and breathtaking curves. The perfect destination for those lazy days of summer, Six Flags Hurricane Harbor Phoenix offers thrills for the entire family with high-energy slides, interactive play structures, a giant wave pool, and mini-versions of the park’s most popular rides for younger guests to enjoy. Members and Season Pass Holders will be the first to experience the park’s new look and feel during a Membership and Season Pass Holder Sneak Peek Weekend on March 9 and 10. A bold, new Caribbean-inspired entrance marquee will greet guests as they first enter the park. Other upgrades include re-imagined ride entrances along with newly renovated dining areas and retail locations. Many of the water slides and attractions will receive fresh, brightly colored paint treatments and new, custom signage. The park is open weekends in March, April and May, for Spring Break March 16–24 and daily operation begins May 18. Six Flags 2019 Memberships and Season Passes are currently on sale. Members can now enjoy priority park entry, preferred parking and tremendous discounts of up to 50% on nearly all food and merchandise purchases all season long. Gold Plus, Platinum, Diamond and Diamond Elite levels are available featuring all the perks of a Season Pass plus other benefits including admission to all Six Flags branded theme and waterparks, skip the line passes, unlimited soft drinks and much more! For more information, visit the Membership Sales Center or go online to sixflags.com and sign up. Set on more than 35 acres in North Phoenix in the Adobe Dam Regional Park on Pinnacle Peak Road, near I-17, the Six Flags Hurricane Harbor Phoenix water park is the largest theme park in Arizona. The park features two of the top slides in the nation including the world’s first, gravity-defying, dueling water coaster, plus a variety of other rides, slides and attractions for all ages to enjoy. The waterpark is operated as a concessionaire of the Maricopa County Parks. For more information on park hours, slides, attractions and admission prices, visit www.sixflags.com/phoenix or call 623-201-2000. Six Flags Entertainment Corporation is the world’s largest regional theme park company and the largest operator of waterparks in North America, with $1.4 billion in revenue and 26 parks across the United States, Mexico and Canada. For 58 years, Six Flags has entertained millions of families with world-class coasters, themed rides, thrilling water parks and unique attractions. For more information, visit www.sixflags.com.